You can download both English and Japanese versions at once. 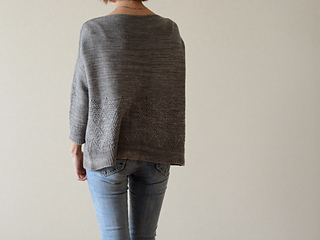 This pattern has been professionally edited and test knitted, and is collaborated with my dearest friend eri and fil-chohu. eri and I made each pattern using the same stitch!! 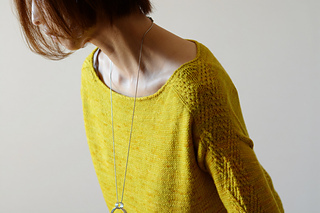 “Olive leaf” is a stylish pullover with Olive leaf pattern on the shoulder and the lower body. You can choose the hem from two styles – high-low slit hem or simple hem. Two versions have slightly different neck edgings. It is worked from the top down seamlessly. The yoke is first worked in the round with saddle shoulder construction, then back and forth separately to the underarm, where they are joined again. 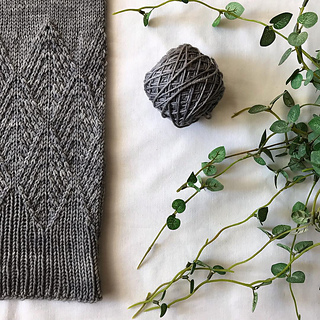 The lower body is knitted in one piece in the round with Olive leaf pattern. Sleeve stitches are picked up around the arm openings and worked down in the round with Olive leaf pattern. Size XS sample (yellow) is worn with + 21 cm / 8¼” ease, and size S (grey) with + 33.5 cm / 13¼”. 3.75 mm / US 5 circular needle; 60 – 100 cm / 24 – 40” or longer (for body and sleeves) – Adjust cable length to fit sts comfortably. “Olive leaf” は, 肩, 袖, 身頃下部にオリーブの葉模様が入った, スタイリッシュなプルオーバーです. トップダウン式に襟からとじはぎなしで編みます. サドルショルダーの構造でヨークを輪編みしたら, 途中から袖開きを作るため前後身頃を別にして袖下まで編み進み, 脇下から再び輪編みします. 身頃の後半にオリーブの葉模様を入れながら裾まで編み進みます. 袖は袖開きから目を拾って, オリーブの葉模様を入れながら袖口に向かって輪で編みます. サンプルは, サイズXS (color: Capsicum)で + 21 cm, サイズS (color: Olive leaf)で + 33.5 cmのゆとりで着用. 3.75 mm / US 5 の輪針; 60 – 100 cm 以上 (身頃, 袖用) – 編む目数に合わせてケーブルの長さは調節する.